Arson is the burning of property, whether it’s a house, land, or someone’s personal possessions. In 2016 alone, there were a total of 1,738 arson offenses in Michigan, and these numbers are merely those known and reported. Arson charges are very serious and so are the penalties if you’re convicted—you could spend the rest of your life in prison. At Michigan Justice, we fight for our clients using comprehensive and thorough criminal defense strategies. If you need assistance, please don’t hesitate to contact us at (586) 221-4100. It is important that you have a lawyer ready to protect your rights should you be charged with arson. A “dwelling” is any structure adapted for human living that was lived in, or could have been lived in, at the time of the fire. It also includes any buildings connected or close to the dwelling, such as a garage. You can also be charged for burning the contents of these structures. Ownership is also irrelevant; If you set fire to a building you own, you can still be charged and convicted of arson. 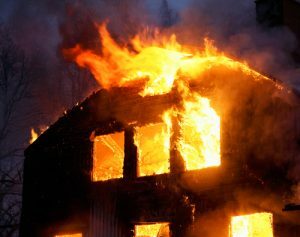 Second-Degree Arson is the willful or malicious burning, damaging, destroying, or explosion of any other dwelling not covered under first-degree arson, or its contents, regardless of whether it is was occupied. Again, ownership doesn’t matter—a person who sets fire to their own building can still be found guilty of arson. The maximum penalty for a second-degree arson conviction is 20 years in prison and a $20,000 fine. personal property having a value of $1,000 or more if the person has one or more prior convictions. Just like first- and second-degree arson, this section applies regardless of whether the person owns the structure or personal property. Third-degree arson penalties include up to 10 years’ imprisonment and a $20,0000 fine. Fourth-degree arson covers the willful or malicious burning, damaging, destroying, or explosion of personal property having a value between $1,000 and $20,000, or any personal property having a value of $200.00 or more if the person has one or more prior convictions. Fourth-degree arson also prohibits willfully or negligently setting fire to woods, prairies, or grounds of another person. It is also illegal to allow fire to pass from a person’s woods, prairie, or grounds to another person’s property thereby causing damage or destruction. The penalty for fourth-degree arson is imprisonment for up to 5 years and a $10,000 fine. Any “dwelling” that is insured against loss from fire or explosion if the person caused the fire or explosion with the intent to defraud the insurer. The penalty for this crime is imprisonment up to life and a fine of up to $20,000. Any building, structure, or other real property that is not a dwelling and insured against loss from fire or explosion if the person caused the fire or explosion with the intent to defraud the insurer. An arson insurance fraud conviction could imprison you for 20 years and cost a $20,000 fine. Any personal property that is insured against loss by fire or explosion if the person caused the fire or explosion with the intent to defraud the insurer. A violation of this section carries a penalty of 10 years’ imprisonment and a $20,000 fine. Each of these laws applies even if the person committing the act owned the property. Fifth-degree arson prohibits damage or destruction by fire or explosion of any personal property valued less than $1,000 by anyone who has one or more prior convictions. Again, it doesn’t matter who owned the property. Fifth-degree arson is a misdemeanor punishable by up to one year in jail and a $2,000 fine. If you’ve been charged with arson or you believe the police suspect you of arson in Michigan or Macomb County, please contact Michigan Justice at (586) 221-1400. Arson accusations must be handled with the utmost attention to detail, and that’s what we do best at Michigan Justice. Consulting with an experienced lawyer from our firm can better ensure that your rights are protected. The head of our criminal defense department, Goran Antovski, is an accomplished defense attorney and has had many cases for and with the Macomb County Prosecutor’s Office. He will rigorously defend your rights and provide the best possible outcome for your case.